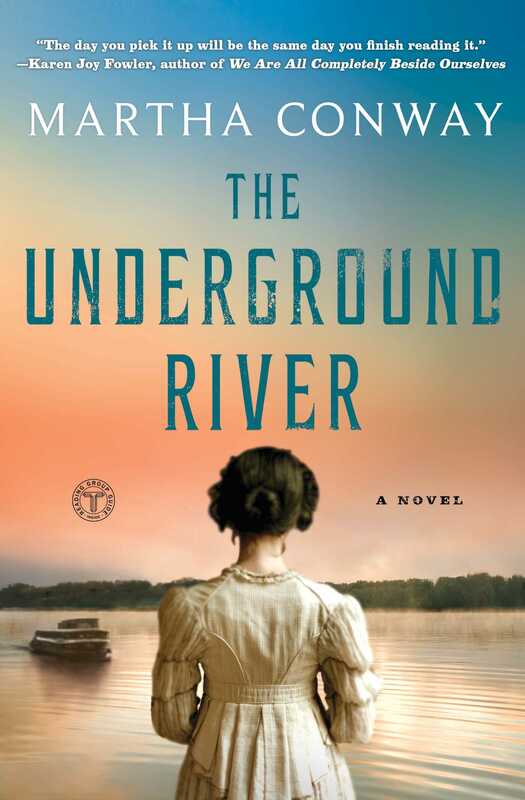 This reading group guide for The Underground River includes an introduction, discussion questions, ideas for enhancing your book club, and a Q&A with author Martha Conway. The suggested questions are intended to help your reading group find new and interesting angles and topics for your discussion. We hope that these ideas will enrich your conversation and increase your enjoyment of the book. May Bedloe, working as a seamstress for her cousin, the actress Comfort Vertue, has not known any other life. It is 1838. On the Ohio River, aboard the boat Moselle, May and her cousin are headed toward Comfort’s next theatrical opportunity when a boiler explosion results in the sinking of the boat. The two women escape with their lives and are forced to seek new employment, but May quickly learns that Comfort has chosen a separate life for herself, excluding May, as a speaker on an abolitionist lecture circuit. Alone for the first time, May eventually finds work on a flatboat, the Floating Theatre, presenting plays in cities along the Ohio under the direction of Captain Hugo Cushing. She finally sees what it’s like to be free of living in Comfort’s shadow and discovers a sense of true community aboard. But her past—and Comfort—eventually find her. Blackmailed into transporting slaves across the Ohio, May is forced to keep secrets from the people who now mean the most to her—a predicament compromising her newfound happiness and a burgeoning romance. She must ultimately become savvy and learn to use her wits if she is to escape a dangerous situation that could put everyone’s life at risk, including her own. 1. What are the most striking differences between May and Comfort? How do their views compare on working and independence? 2. During the Moselle disaster, May rescues the young girl Giulia from drowning, pulling her to safety. Throughout the story, Giulia appears to May in several of her dreams. What does her presence seem to symbolize? 3. What is Hugo’s initial perception of May? Why do you think he decides to have faith in her even though she does not know how to do most of Helena’s job? 4. Why is Hugo’s gift to May—a key with which she can lock her stateroom—so meaningful for her? Do you think it is meaningful for him as well? 5. Why does May feel so deeply obligated to do what Mrs. Howard demands of her? Is the reason more than the money she “owes”? 6. Several references are made in The Underground River to the lack of discernible differences between people who live in the North and the South. Why is this an important theme? 7. Why do Liddy and Hugo prefer to pretend slavery does not exist, and why does May struggle so much with that behavior? 8. What does May realize after she goes to warn Comfort about potentially violent hecklers? How does her character shift after this interaction? 9. How would you characterize Mrs. Howard? What is so polarizing about her? 10. May sees things in absolute terms and struggles with recognizing nuance. How does this trait inform her relationship with others, and specifically with Hugo? 11. May believes that a play requires giving oneself over to the actors and actresses. What kind of emotional changes take place in her after she watches and enjoys the birthday performance Hugo planned for her? 12. May disliked Dr. Early at first because she sensed that his behavior was a conscious performance. In what ways does pretending or “faking” help the characters in the story, and it what ways does it hurt them? 13. May makes several observations throughout The Underground River that unconsciously acknowledge how painful her relationship with Comfort had been, such as her reaction when she watched an abused dog follow its owner around: “I found myself wondering how a creature could stick to a master so clearly bent on its very destruction.” Why might a person or animal tolerate consistent, unrelenting abuse? 14. May helps to save the lives of four slaves, but her guilt over Leo’s death in the Floating Theatre fire painfully eclipses the good she has done. Why does May take full responsibility for what happened with the fire, even though several other people had been responsible for it? 15. In the last moment of the novel, May uses her Greek to lie to Hugo—but why does that lie feel like a kind of victory for both of them? 1. In the story May wonders, “Was every good change made in the world the result of successful bullying?” Have each member of your reading group jot down one major event, change, or movement in history that ultimately benefited society. Might bullying have been a tactic for each of those changes? 2. May’s social miscues make her ostensibly offputting, especially alongside her gregarious cousin Comfort, until she finds her place on the Floating Theatre and discovers a true sense of belonging. Can you think of a time when you were perceived as a different person because of the company you kept, or because that person controlled the way you were perceived? Have you ever cut ties with a friend, family member, or significant other, only to discover you are a completely different person without them? 3. It’s show time! Round up your book club for a night at the theater. Check for group rates or discounted tickets on resale websites, or browse local college and university theater websites for student plays that might be more affordable to attend. 4. The Underground River deftly illustrates the moral struggle between abiding by a law and doing the right thing—even today, those two don’t always align. Can you think of modern legal scenarios that might reflect this dilemma? Of the novels you’ve written so far, how does The Underground River compare in research? With The Underground River I got lucky right away. I knew I wanted to write a novel set in Antebellum America, and I wanted to write about early American theater. On my first day doing research, I came across a short paragraph about a flatboat theater on the Ohio River in the 1840s, owned by an Englishman who had moved to America with his family. That sparked my imagination, and I grew the story from there. For some of my other novels, it has taken a lot longer to find the directional spark. What inspired you to write the character May? Do you ever base your characters on real people, or do you usually create them entirely? For the most part, my characters begin as composites of people I know; in May’s case, she fell under the category of those “socially awkward.” In addition, a friend of mine once told me about someone she knew who was absolutely unable to lie, and I thought that would be an interesting trait for a character. Of course after you begin writing, the story itself begins to shape the character, too. So for me, May became less and less like the people I know, and more and more like herself. I didn’t know that May was a little bit snarky until I wrote the first scene in the novel, but it fit in with how I’d imagined her so far. What drew you to use the sinking of the Moselle as a starting point of the story? Had you originally intended to write about the Underground Railroad? What came first in your story development? I was looking for an event that would wrench the two cousins apart, and the sinking of the Moselle seemed like a dramatic way of doing that. Also, it’s a good historic pushpin: riverboat travel was popular for only about twenty years, after which it was more or less replaced by train travel. As an Ohioan (or Buckeye, as we call ourselves), I knew that I wanted to write about the Ohio River, and the fact that it was the natural division between the North and the South in Antebellum America just seemed like too good an opportunity to pass up. So yes, I knew very early on that the Underground Railroad would play a part in the story. I conceived of the character Lula from the very beginning—a young slave girl who’d been raped, who’d had a baby, and who was running away. I named her after a woman I shared an office with just after college, who introduced me to Zora Neale Hurston, Paule Marshall, and other great African-American authors. What was the most difficult part of writing The Underground River? 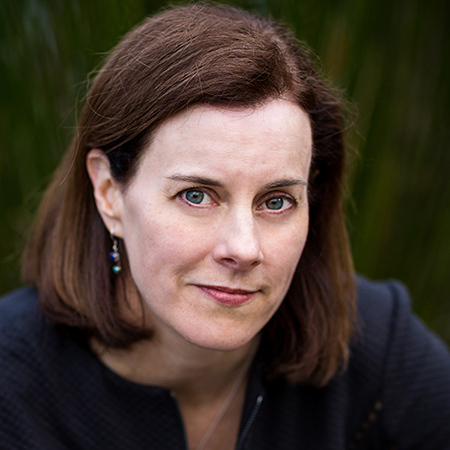 What challenges exist in writing historical fiction that a nonwriter might not be aware of? One of the most difficult aspects was describing some of the characters’ moral ambiguity around the issue of slavery. It was difficult for me to imagine how certain people—those who didn’t believe that slavery was criminal and immoral—would rationalize their beliefs. Navigating May’s change from bystander to participant in the abolitionist movement was also tricky. She is very single-minded, and that can be both a virtue and a flaw. One of the biggest challenges when writing historical fiction is writing something historically accurate even when I myself have more modern convictions. I have to be true to the times, but I also have to be true to myself. What role would you have played on the Floating Theatre? Which member of the troupe did you most identify with? I was involved in theater quite a bit in high school, but those days are long gone. I’m afraid I’d be stricken with stage fright, like May, if I were asked to act on stage now. Do you feel drawn to develop characters who are more like you or less like you? Where do you find inspiration for writing them? It’s easier for me to develop characters who are less like me, but still have some traits that I share. If a character is too much like me, I don’t want anything bad to happen to her! And that’s not very good for drama. My inspiration comes from the people around me, but usually not close friends or family—it’s better for me to start with an incomplete idea of a character so I can change her according to the needs of the story. Also, maybe because I’ve spent a lot of time juggling writing with raising my two children, I find that children are a great inspiration. I always try to have at least one child in my novels somewhere. Children take life very seriously, and have unusual theories about many topics, and I find that refreshing. I am also inspired by reading Charles Dickens, Anthony Trollope, Susanna Clarke, and other great character creators. Which novel has been your favorite to write so far? Of all your novels, which character are you most attached to? I’m very attached to May. I like to imagine her story continuing with Hugo; her matter-of-fact way of aiding those in need, and her unintended humor. The Underground River was both challenging and fun to write, and so far it’s my favorite. In addition, since I have six sisters and no brothers, I’m also fond of my novel Thieving Forest, which is about a family of sisters. “Write what you know,” an adage often attributed to Hemingway, is a rule by which many writers abide. What are your thoughts on it? Well, as a twenty-first-century writer I don’t know what it’s like to be a nineteenth-century costume designer, so I suppose I’ve broken that rule already! But if I broaden the meaning—and perhaps Hemingway meant it to be broad—I can say that I certainly know something about feeling socially awkward, and trying to learn a new job quickly, and becoming suddenly aware that there is something wrong in the world that you should help put right if you can. Like a method actor, I’ve benefitted from searching in my own history for ways to connect to the characters and situations in my novels. Are there any new authors or books you’ve been reading lately? What would you recommend to readers who loved The Underground River? I thought Station Eleven by Emily St. John Mendel was brilliant. Like The Underground River, there is a terrible situation in the world, but the story is not without hope in the end. What do you find most rewarding about being a creative writing teacher? What parts of it do you struggle with? I learn so much from my students. They help me to be open to new ideas, which is absolutely vital, I believe, if you write fiction. In addition, I also have the great good fortune to write and talk about the craft of writing with them on a weekly basis. The challenge is that I could spend too much time talking about writing instead of writing, so I have to make sure to schedule my time carefully. Are we ever going to see May or Hugo again in an upcoming novel? Do you have any plans to write a book series? I have no plans for a sequel at present! However, The Underground River is the second in a planned trilogy of novels set in Ohio during several key periods in U.S. history, of which Thieving Forest was the first.